Tom Brady just led the biggest comeback in Super Bowl history to win his fifth Super Bowl, all but cementing his status as the greatest quarterback of all time. Brady broke the record for most passing yards in a Super Bowl with 466 en route to the game's MVP honors. He was simply terrific when it mattered most, but was it his best Super Bowl performance ever? Here is a ranking of Brady's performances in his seven Super Bowl appearances. Brady's Patriots lost to the Giants in the Super Bowl for the second time, and while his numbers weren't terrible, Brady missed a throw when it mattered most. Up 17-14, the Patriots faced a 2nd-and-11 on the Giants 44 with 4:00 remaining. Patrots receiver Wes Welker broke free down the field, and a completion to him would have effectively ended the game. But Brady made a less-than-steller throw and Welker couldn't make the tough catch. That's a throw Brady will want back for the rest of his life. Again, Brady's numbers weren't abysmal in this game. But he didn't get the victory, and Brady would be the first to tell you that any performance in a loss is worse than any performance in a win. Brady's Patriots had a chance to become the first team to go 19-0, but the Giants sacked Brady five times and limited the Patriots' high-octane offense to just 14 points. Brady led a touchdown drive to take a 14-10 lead with 2:25 remaining, but the Giants would come back to score and pull off the 17-14 upset. Brady did not turn the ball over in his third Super Bowl victory in four years. Eleven of his 23 completions went to Deion Branch, who had 133 receiving yards and took home the game's MVP honors. This remains the only time Brady won the Super Bowl and was not named MVP. Brady was terrific in this Super Bowl, which like Super Bowl LI was played in Houston. After Panthers quarterback Jake Delhomme found Ricky Proehl for a 12-yard touchdown to tie the game at 29, Brady got the ball at his own 40 with 1:08 remaining. His first pass of the drive was incomplete, but Brady followed that up with four straight completions to set up Adam Vinatieri's 41-yard game-winning field goal. He was named the game's MVP. Brady threw two interceptions but managed to throw for 328 yards and four touchdowns on Seattle's vaunted Legion of Boom defense. Brady was surgical when it mattered most; facing a 24-14 deficit in the fourth quarter, Brady led two touchdown drives to put the Patriots ahead 28-24. The Seahawks had the ball on the Patriots' 1-yard line with just seconds remaining, but they famously elected to pass instead of handing the ball to Marshawn Lynch. Malcolm Butler intercepted Russell Wilson at the goal line to give Brady his fourth Super Bowl. 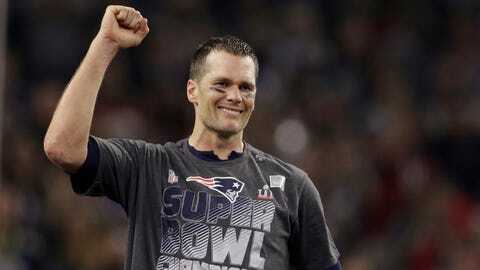 Brady was named Super Bowl MVP. In his first Super Bowl start, Brady essentially played the role of game manager; what made his performance so impressive wasn't his stats, but how well he played considering he was a second-year backup quarterback who was drafted 199th overall. Brady threw for just 145 yards but, crucially, he did not turn the ball over, and the Patriots were able to pull off an upset victory of the St. Louis and its Greatest Show on Turf offense. Despite the relatively modest stat line, Brady's composure and mistake-free football earned him the MVP award, which he has now won four times. Brady appeared to be off his game in the early going; he missed multiple throws uncharacteristically and threw a costly pick-six. The Patriots trailed 21-3 at halftime and 28-3 deep into the third quarter, and it appeared the Falcons were headed to their first Super Bowl victory. But Brady was not to be denied—he engineered three touchdown drives to complete the biggest comeback in Super Bowl history and win his fifth Super Bowl. Brady won the MVP award and set the record for most passing yards in a Super Bowl with 466, but it's the sheer magnitude of the comeback that makes this his best Super Bowl performance ever.